With filming on Shadowhunters set to begin a week from this Monday, the cast and crew are already hard at work prepping for the start of principal photography. This week, executive producer McG has been spoiling us with behind-the-scenes photos (please keep them coming), and he’s done it again, now that our Alec, Matthew Daddario, is in Toronto. Sounds like McG is going to have his hands full with Jace, Alec, Isabelle and Simon. How is it possible for a cast (and producer) to be this gorgeous?! Shadowhunters begins filming Monday, May 25 in Toronto and will premiere in early 2016 on ABC Family. I am ridiculously excited for this!!! I think I annoy my friends every time I mention “Shadowhunters” .😂 But I cannot wait!!! Hehehe I even have friends whom I literally only ever talk to about it! May I add IZI IS MEANT TO BE THE FRAKING TALLEST!! I think she’s tall, I don’t know how tall she is but she is a model too, but the guys are damn tall so she looks tiny specially next to matt I think he’s over 6’2 so anyone would look tiny next so someone that tall haha. I don’t think it matters if she is super tall, she will still look taller than Clary because Kat McNamara is super tiny. 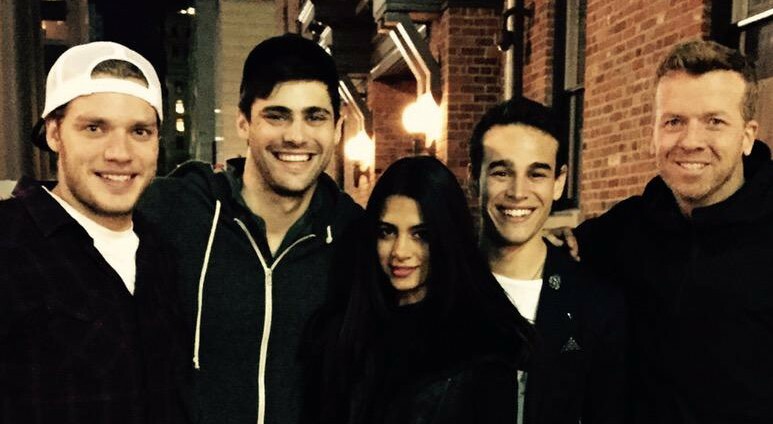 emeraude is 5’9, while kat is 5’4 1/2, dom and harry are both 5’11, and mat is about 6’1-6’2 (according to esme) i don’t know alberto’s height but it looks like he is about 5’10. Perfect, right! I love all the behind the scenes photos and info we are getting, it makes me feel so involved! Love them!!!! WHOOO I CANNOT WAIT!!!! I wonder if Dom’s going to dye his hair or not? They are looking great, what about Magnus?!? Will Magnus appear in the first episode? Probably not. So it’s possible he may not be cast for a few weeks. They look better in black! Don’t know, but if you find out snap a ton of pics, please! SQUEEEE…. Can you hear me, fellow Shadowhunters? !